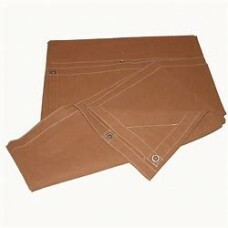 General Purpose Fire Resistant Canvas, Mildew And Water Resistant Tarp 10 Oz With Grommets Every 24" All 4 Sides. Mildew,Water Resistant, Fire Retardant Tarp 10 Oz With Grommets Every 24" All 4 Sides. Custom sizes available. 16' X 20' Canvas 10 Oz, Flame Resistant ..
20' X 20' Canvas 10 Oz, Flame Resistant ..
20' X 30' Canvas 10 Oz, Flame Resistant ..